To remove organic matter in water or refined wastewater, there are various chemical and physical methods, each of which has its own advantages and disadvantages that are selected according to the needs of the system. One of these methods is the use of carbon-activated carbon substrates, or carbon filters. To remove organic matter in water or refined wastewater, there are various chemical and physical methods, each of which has its own advantages and disadvantages that are selected according to the needs of the system. One of these methods is the use of carbon-activated carbon substrates, or carbon filters. Since all organic matter in the water or refined wastewater has a carbon structure, activated carbon, based on the chemical principles, is the best absorbent material for such materials. Organic matter often has a lower density of water. 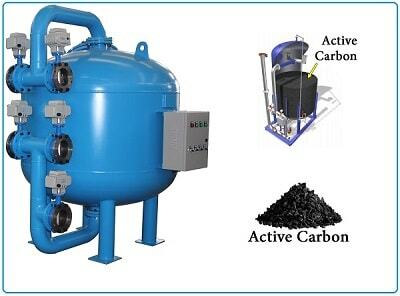 During this process, the fluid enters the top of the reservoir, the active carbon granules are located inside the reservoir and in contact with the fluid and absorbing the organic matter in the fluid through the absorption method. After a while around the granules, a jelly-like layer is formed. Which reduces the efficiency and increase the pressure inside the tank, which requires a reverse wash tank at this time. At this time, the water enters high speed from the bottom of the reservoir and, by creating volumetric expansion, separates the granules from each other and removes the saturated layers with it from the inside of the filter. Activated carbon granules are used after a while and, depending on the amount of organic matter used and saturated inputs need to be replaced. Granular activated carbon (GAC) is commonly used to remove organic matter and disinfectant residues in water sources. This not only improves taste and minimizes health risks, but also protects potential damage to other water purification units such as reverse osmosis membranes and ion exchange resins resulting from the oxidation or contamination of organic materials. . Activated carbon is very popular because of the multifunctional nature and the fact that there is nothing harmful to the treated water. Most activated carbon is made from raw materials such as wood, coal and crude. Typically, the outer surface of activated carbon is about 1,000 m2 / gm / gm). However, due to the different raw materials, different types of activated carbon are produced according to their hardness, density, particle size and pore size, exterior surface, extraction capability, and pH. These differences in properties make some carbon more preferable to the rest of the applications. The two main mechanisms by which active carbon removes water contamination is catalytic absorption and reduction. The organic matter is removed by absorption and the remaining disinfectants are eliminated by catalytic reduction. In the process of designing carbon filters, there are two important issues that need to be considered together. First, the rate of adsorption of particles to the filter, and the other speed required for reverse washing. With the help of this isotherm, it can be estimated how long a surface of the bed (sand or carbon) is to be chosen if the speed of absorption is chosen. In the case of the choice of reverse wash speed, several parameters are also involved, the fluid temperature, viscosity, particle porosity coefficient and other information can be used to determine the proper reverse washing speed of a bed. It should be noted that in the absence of proper design, the reverse-wash of carbon effectively will lose its efficiency. Farab Zist Farzaz Engineering Co., a leading company and supplier of various industrial water and wastewater treatment systems and equipment. 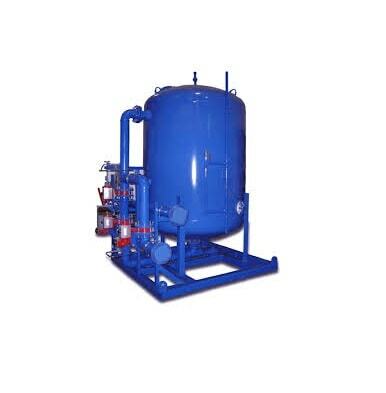 The design and production of a carbon filter device is also one of the products offered by this company. 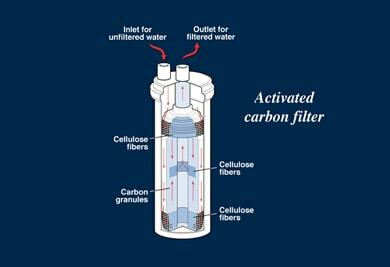 For further details and the price of carbon filter, please contact our experts. Farab Zist Faraz Engineering Company aims to promote community health and environmental preservation as the principles of sustainable development in the areas of consulting, designing, construction, installation, commissioning, management and supply of water treatment and sewage treatment equipment. Based on the knowledge of its creative and capable specialists and using the technologies of the day, the company has carried out numerous projects in the field of water and wastewater treatment in the country. The company is trying to use the knowledge and experience of the experts of the company and in dialogue with experts and experts in this field, both in the manufacturing sector and in the scientific and academic sectors, steps to upgrade the manufacturing technology in accordance with the needs of customers and optimal use. From the sources of energy and, consequently, the production of sustainable products in line with the needs of society and environmental issues.